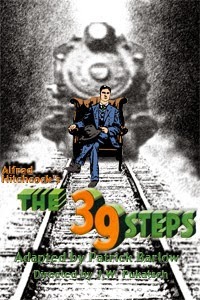 The Chapel Street Players have never backed down from putting on challenging shows, but THE 39 STEPS poses a special kind of challenge: Take a 1935 Alfred Hitchcock movie and recreate it on stage using just four actors and a few props. If you haven’t seen the film, it’s got well more than four characters. And multiple settings, including the outside of a moving train, the Scottish countryside, and the London Palladium. The sometimes mad dash to deliver almost every line in the film and change the set to fit the scenes is hilarious, and you end up with something that is part tribute, part parody, and very funny throughout. Taking on the roles are Tom Trietly, in the only single-character role as Richard Hannay, a hapless Englishman who finds himself a murder suspect after inviting a doomed German spy to stay at his home for the night. She’s the first of three love interests for the “dashing, wavy-haired” Hannay, all played by Anna Keane, who delivers over-melodramatic (as intended) spy, sheltered country wife, and 1930s firecracker smoothly. All of the other characters are played by Bethany Miller, billed as “Clown 1,” and Andrew Dluhy, as “Clown 2.” Despite their minor-sounding billing, these two carry the show with a rapid-fire succession of characters, including vaudeville performers, police, spies, train conductors, and townsfolk of all kinds. Often within the same scene, with more than one of their characters present. There’s plenty of gender-bending and over-the-top accents, with Miller stealing most of her scenes. Trietly is goofily charming as Hannay, presenting the protagonist as a sympathetic, relatively normal guy thrown into a world of thrills and intrigue. Few shows are as fast-paced and fun as THE 39 STEPS, and CSP’s four stars deliver the entertaining show it’s meant to be. If you don’t think of Hitchcock as fun, you’re in for surprise. You may never look at his (often darkly comic) classic films the same way again. This review was originally published in Stage Magazine.